This is a short list of our affiliate partners. These Affiliate Partners assist us in servicing our client's at the lowest price possible. Our Clients are not charged additional fees to have our direct access to our Affiliate partner's services. We believe that keeping our client's cost down, and providing them with good marketing service is a winning combination. 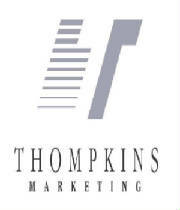 Visit Thompkins Marketing's, an affiliate partner, website by clicking on their Logos below. R.J. Robinson and Associates has numerous Afilliate Partners. Through this network, we are able to showcase this vast list of our Affiliate's clientele and the companies they provide services to. Below is a list of our Affiliate Partner Thompkins Marketing client list. When you join R.J. Robinson Marketing through our Deluxe Marketing Programs, you will receive the services of all of our Affiliate Partners. Your name, too, can be added to this very prestigious list.